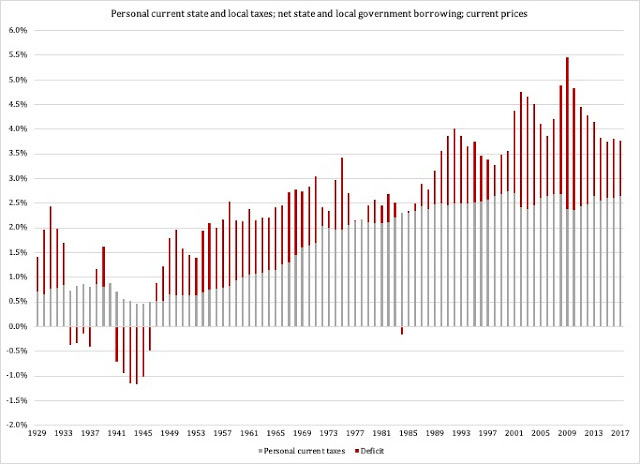 What is less known is that our states, which are not supposed to run deficits, actually are prolific borrowers. Their addition to our state's indebtedness is concealed by the fact that it is spread out over 50 jurisdictions. Although some states stand out for their abysmal fiscal performance - California and Illinois come to mind - the problem is substantially bigger than the media news cycle may tell us. In 2017, a "deficit elimination tax" would have raised the tax for the average taxpayer by more than 42 cents for every dollar he actually paid. Disregarding dynamic effects of such a drastic tax hike, the total amount of new state revenue needed was $190 billion. One point to keep in mind: the debt cost ratio to personal income comes in such small fractions that small variations can appear large. 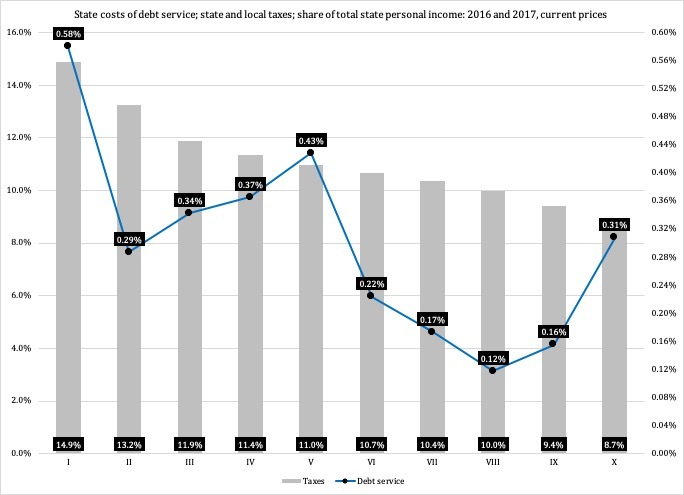 That said, it is difficult to deny the fact that states with higher taxes tend to spend more money, relatively speaking, on debt service than states with a more lenient tax burden. The correlation makes sense: we can expect states with relatively high taxes to have larger welfare states. Welfare states cost money based on ideologically defined preferences, not on the ability of taxpayers to pay for the entitlement programs. Inevitably, the cost of a welfare state outpaces its own tax base; rather than changing their ideological course, governments then tend to make up for the fiscal shortfall by taxing future taxpayers. 1. How indebted are states really? In other words, can they actually get out of their indebtedness? 2. How does the state debt burden distribute among the states? I will get back to these questions in future articles, in particular with the size and focus of the welfare state in mind. For now, let us note that in the two years surveyed here, Nebraska, Oklahoma and Wyoming had no debt service payments to make. It is also worth noting that this does not tell us that zero debt payments automatically goes hand in hand with low taxes; in 2016, Nebraska had the 16th highest taxes as share of personal income, with Wyoming 19th and Oklahoma 46th. That said, the moderate correlation in Figure 2 is still there. More to come. Stay tuned.